I (Jason/Seamus) owe a huge thanks to Raz for working hard to guide us through the drams, and to Fergus for organizing such a stellar group meetup in the Bay area. All in all, I had the easy part: some basic marketing and logistic coordination to get it up and running, which was made nearly painless by Google. 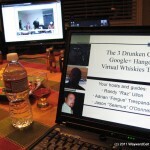 From my perspective… all in all I consider our first virtual tasting to have been a mild success. While it was great to see so many people gathered for the tasting, I didn’t get the deeper interactions we’ve experienced at more official seated tastings. Our largest hurdle was some of the tech issues with sound, causing some feedback and echoing through much of the event. This helped to focus the 3 larger groups within themselves and treat the camera as merely another observer rather than using the camera to speak directly to the other participants. So, what went well? 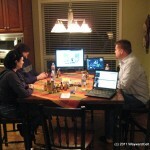 Logistically, we were able to gather and get the hangout up and running easily. The kits were all shipped on time and contained the right products. We had enough connection slots for those who wanted to join thanks to organizing in groups to minimize the overall number of connections (hopefully something we won’t have to worry about in the future if Hangouts on Air are rolled out to us). What didn’t work as well? As noted about, the sound issues prevented clear communication. Some groups rushed through the drams and some lagged behind, creating a disconnect in attempted discussions. 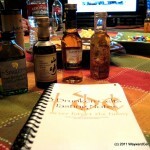 I found that the discussions were so chaotic at times, that I was unable to take proper notes in my 3DC Tasting Notebook, leaving me without clear ideas about the whiskies we tasted, just general impressions. And, overall, we didn’t lead as well as we could have. First off, I believe any of our future virtual tastings need to be run like a proper conference call (I blogged about how to do this over on my work blog). Defining a specific speaker/host, ensuring everyone is muted unless speaking, and really focusing on guiding a collective tasting will take us far. A free for all is simply too chaotic. Secondly, while the group environments helped to make the tasting fun for those in the groups, the dynamic unfortunately left our individual attendees faltering about for a bit while the groups talked amongst themselves. Again, this is where a driven leader, combined with controlled and focused groups would help us provide a much greater benefit to all attendees/participants. I do believe that with a little more effort and a bit more focus we can run some really great and educational hangouts via GooglePlus. The tough part, as I see it, will be in retaining that 3DC personality to ride the line between fun and chaos. This entry was posted in 3DC News, Misc. 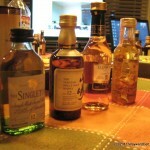 Events, Miscellany and tagged g+, googleplus, hangout, recap, tasting, virtual tasting. Bookmark the permalink.